Like a lot of things in life finding Pilsdon Pen was a fluke. 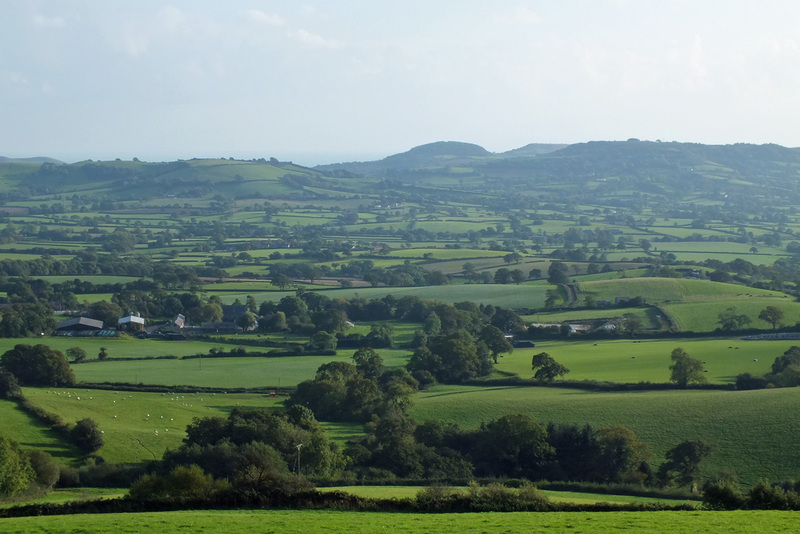 We were driving back to Bridport in Dorset after visiting Lyme Regis and me being, well, me, decided to return via the country roads instead of the direct route. Admiring the views surreptitiously as I was driving along the narrow winding road, it was a relief to find a layby to pull into. Obviously a spot with a view as there were already a couple of cars parked there. The panorama was spectacular, rolling hills, cliffs and in the distance, the sea. 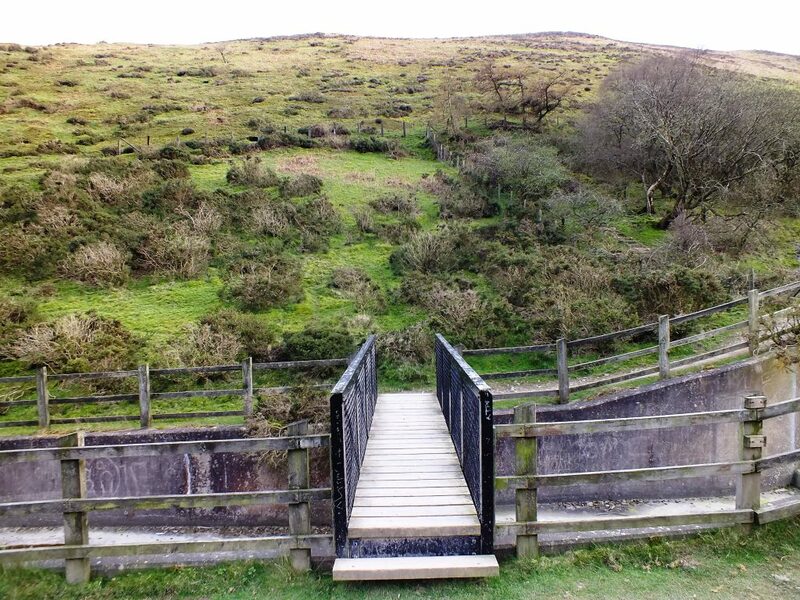 After taking a few photos, I headed across the road to a stile that I had spied which led to a path up a hill. 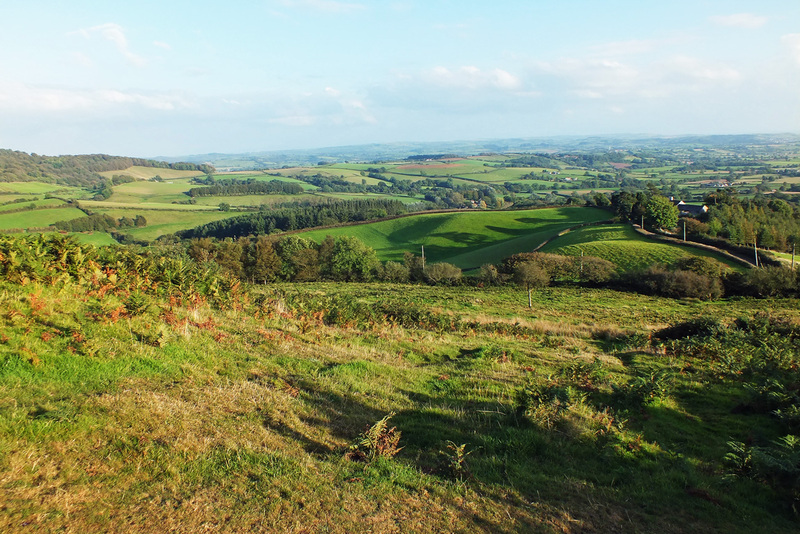 Thinking that I might get even better views from the hill, I hopped over the stile. 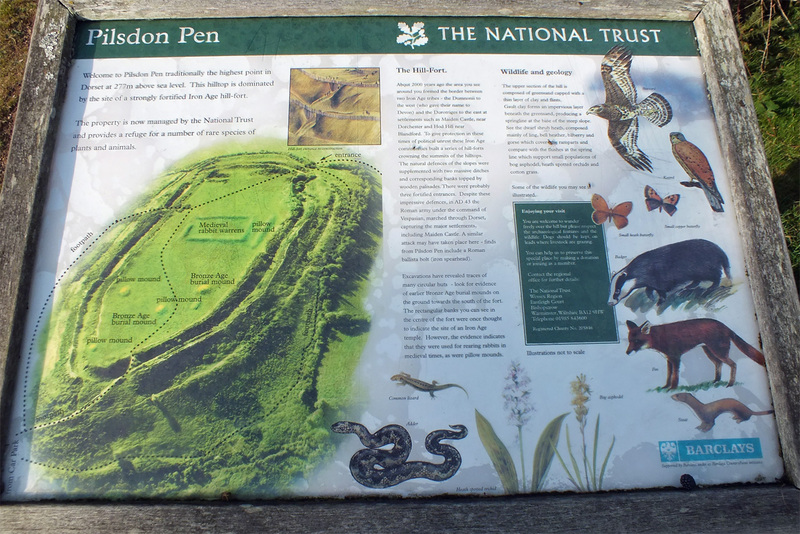 And found that I was on Pilsdon Pen, the highest point in Dorset. So of course I had to climb to the top, and after a bit of huffing and puffing and a stop or two at a conveniently placed bench, I got to see the 360 degree views. And I was particularly fascinated by the late afternoon shadows of the trees bordering that field. I discovered another garden not too far from here a few weeks ago. 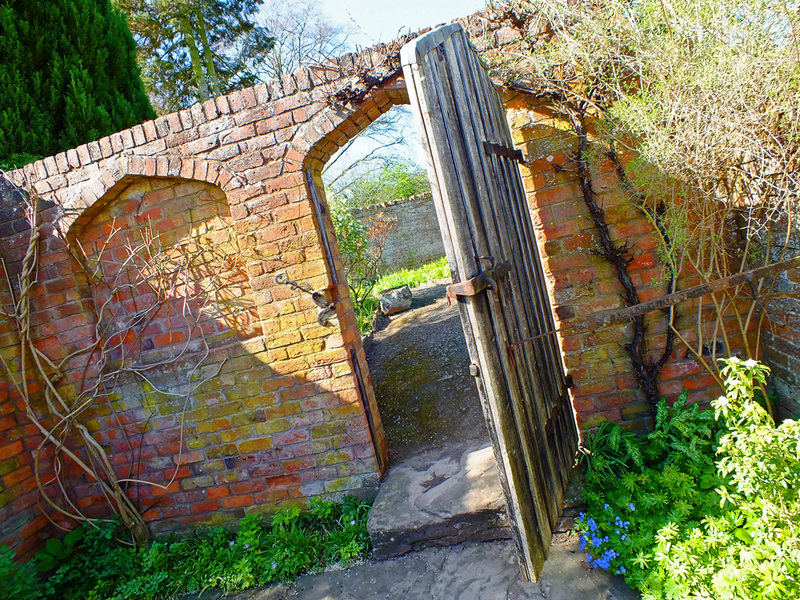 Apparently it is used as a location in ‘The English Garden’ magazine if anyone reads that. 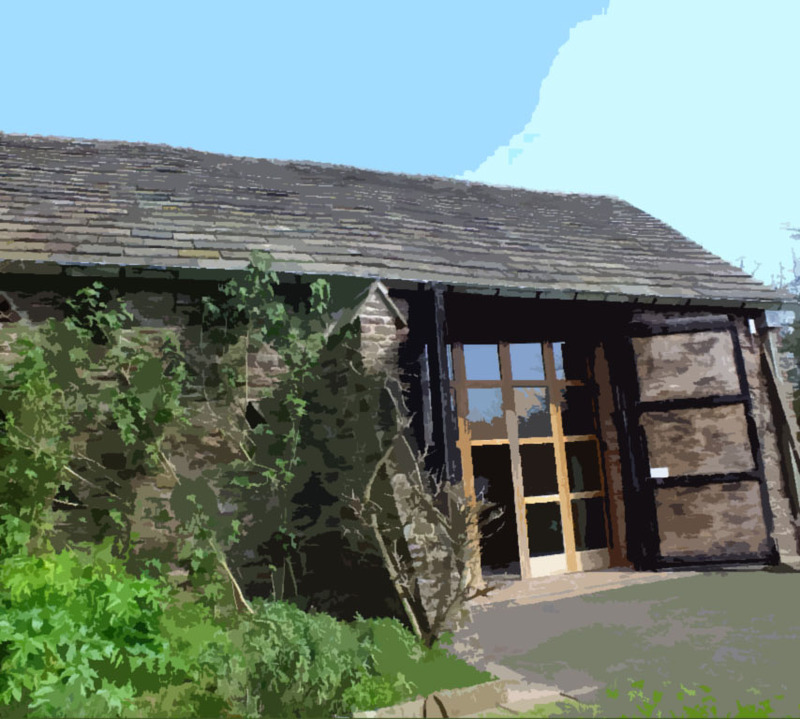 It also has a small café in a beautiful Tithe barn serving lunches and cakes, warm lemon & treacle tart anyone? So definitely worth a visit, although on this particular day I was feeling rather ill so had to sit and watch the OH devour a lovely chicken sandwich. 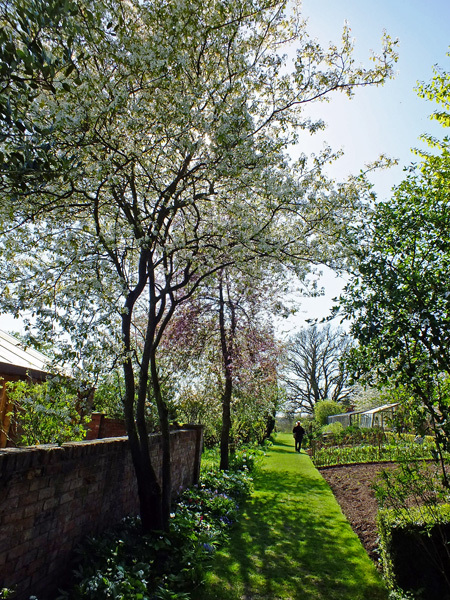 This post is linked with Cee’s Which Way Challenge, Jo’s Monday Walk and this week’s Travel Theme from Ailsa which is Blossom. 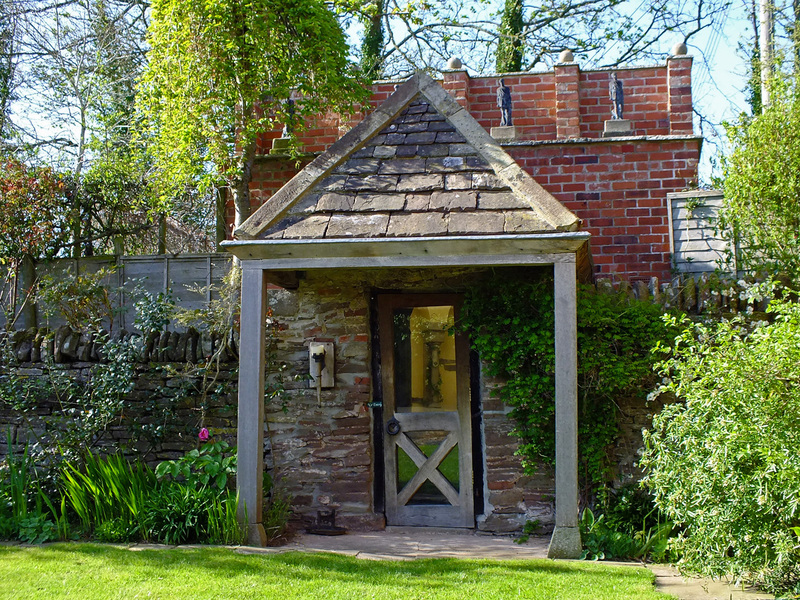 Probably the first thing you notice once you enter the gardens through the Cider Press, is this gorgeous Granary with the Oast Houses. 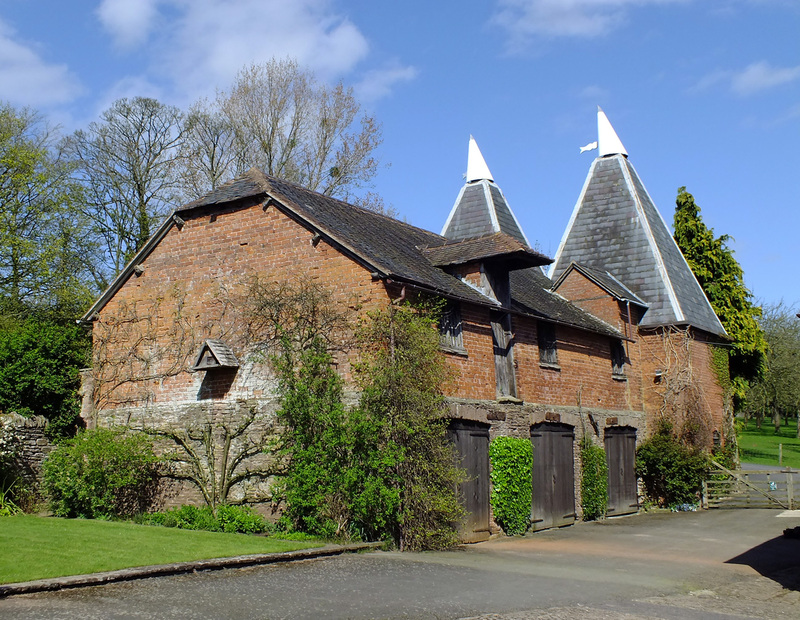 I used to think Oast Houses only existed in Kent. Not so, there are quite a few in Herefordshire and Worcestershire and still plenty of hops in the fields. 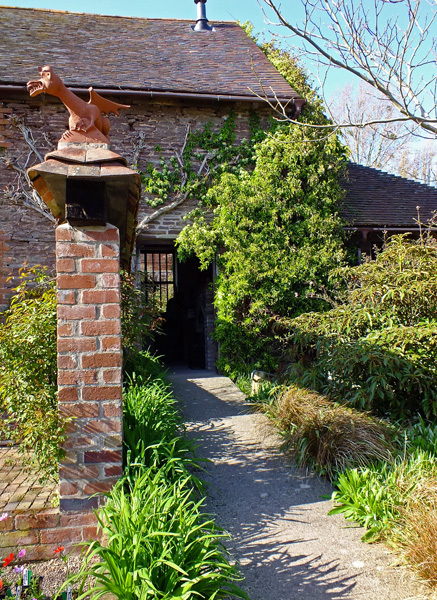 I spent a fair while just photographing these gorgeous old buildings before venturing into the gardens themselves. But what a treat awaited me. The problem was where to start? The Pigeon House Garden? The Spring Garden? What a choice. 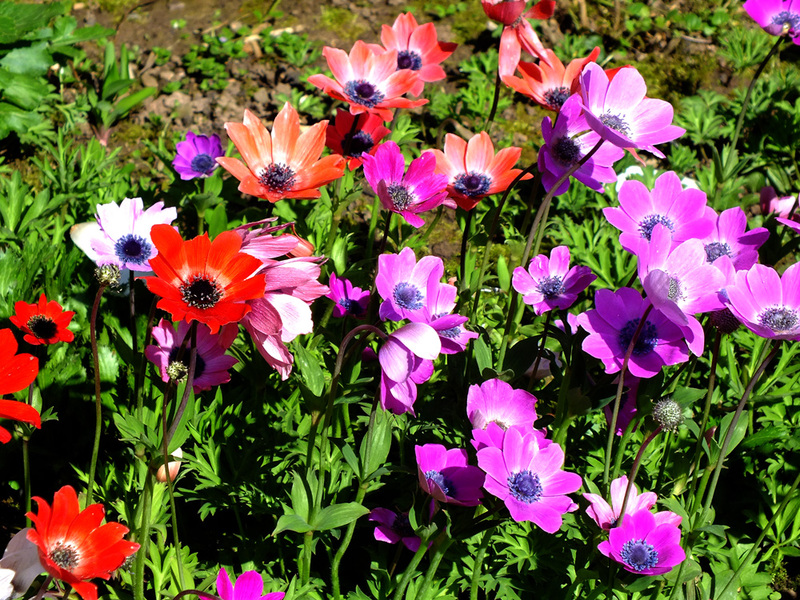 The Spring Garden was a delight with these jewel-like anemones flowering in the sun. 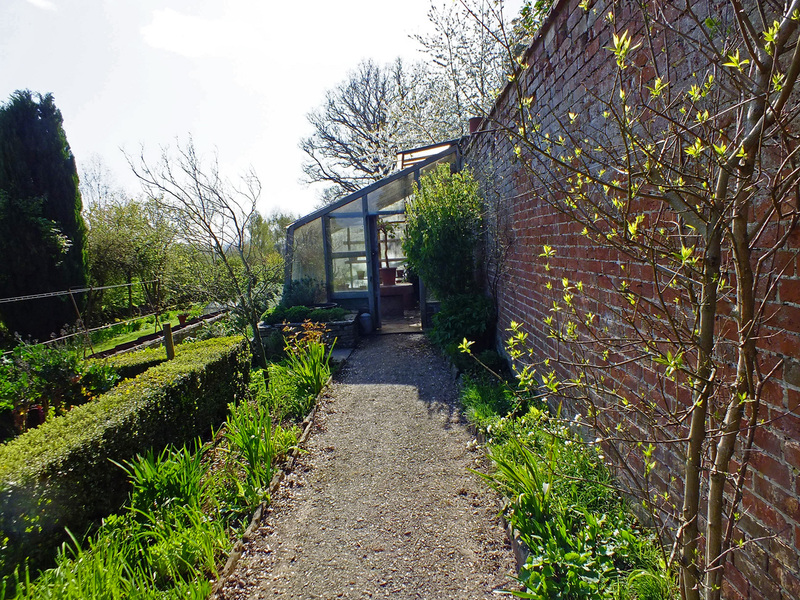 A crooked path leading to a sweet little summer-house with magnolia blossom overhead. 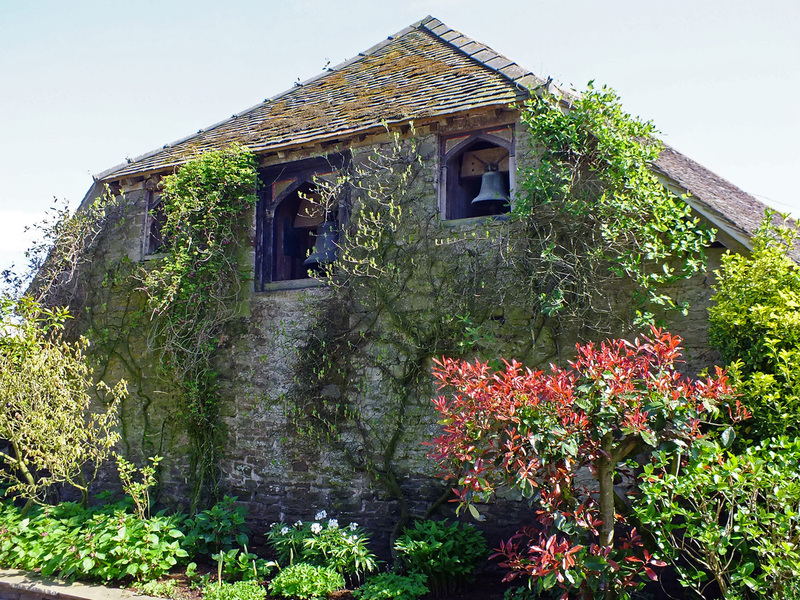 Leaving the Spring Garden behind brings you out in front of the Manor House, with pots of bright tulips outside the porch and walls festooned with budding wisteria. 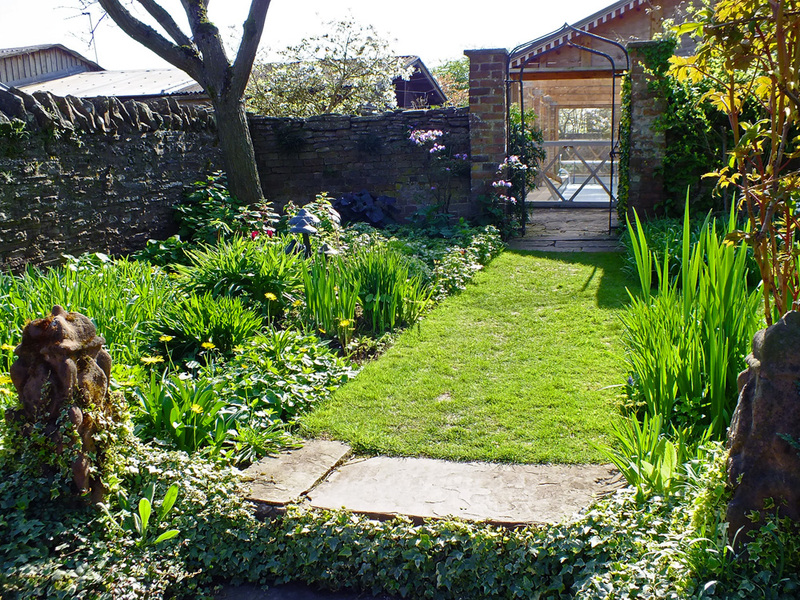 The Main Lawn softens the driveway which leads to the farmyard. And a barn with bells. 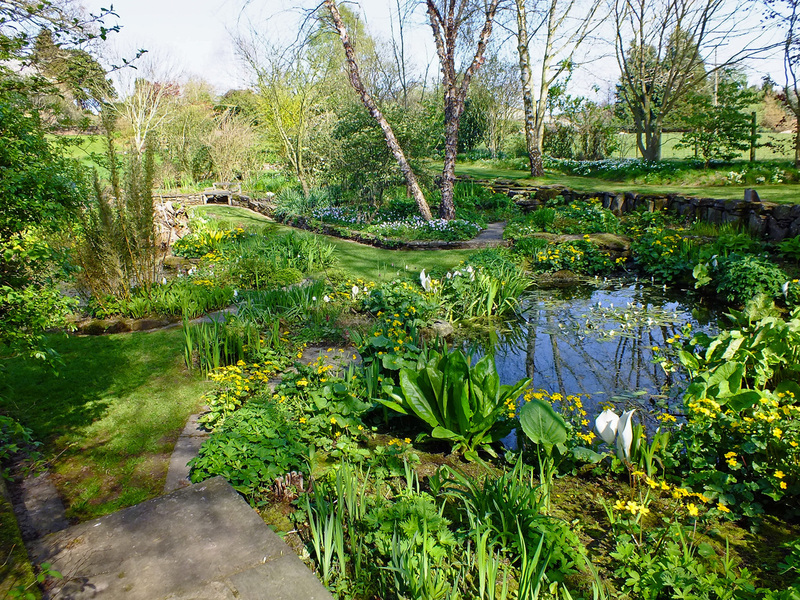 The Bathing Pool Garden was intriguing, especially as this leads to the Rock Pools where Fritillaria meleagris and Pulsatilla vulgaris flowered around the pool and blossom hung overhead. 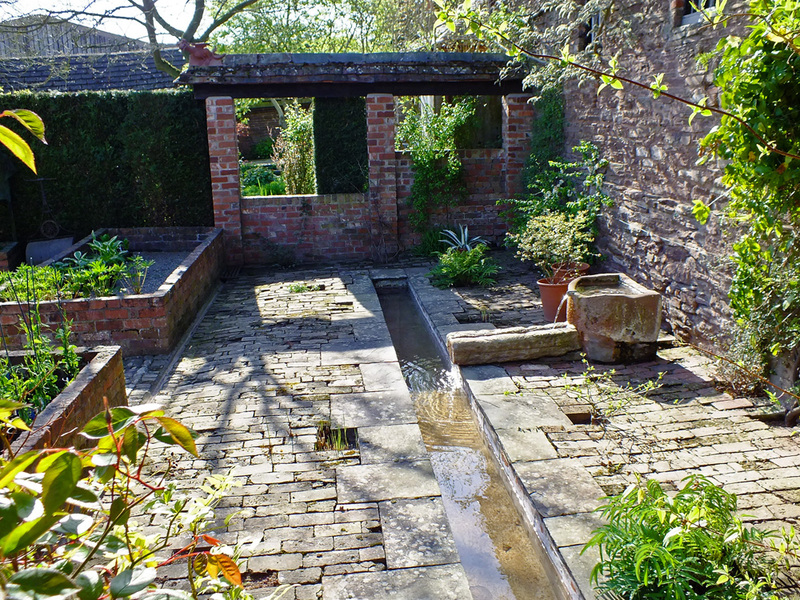 Doorways and water features entice you into the Elizabethan Garden with violet-blue clematis dripping over the wall. 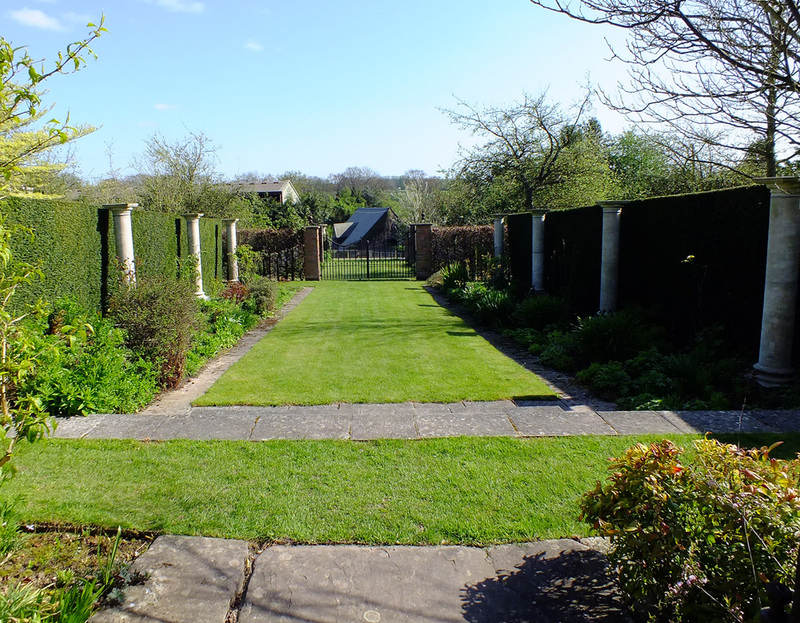 Next the Long Walk leads you past the Kitchen Garden, the Sunken Garden, the Pillar Garden and finally the Paddock Garden. See the blossom? With plants and pots and watering-cans to catch the eye. 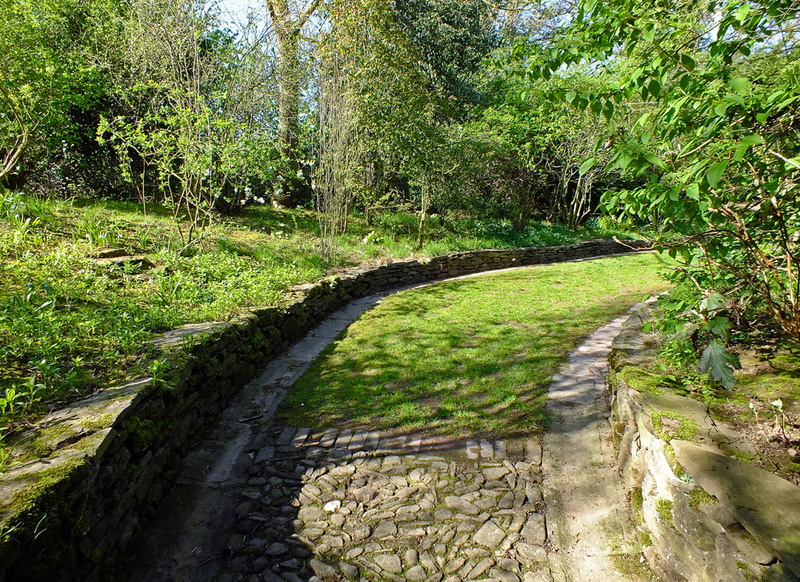 The path leads down to the Dingle, the furthest area of this lovely garden and where the Spring and the Grotto can be found. 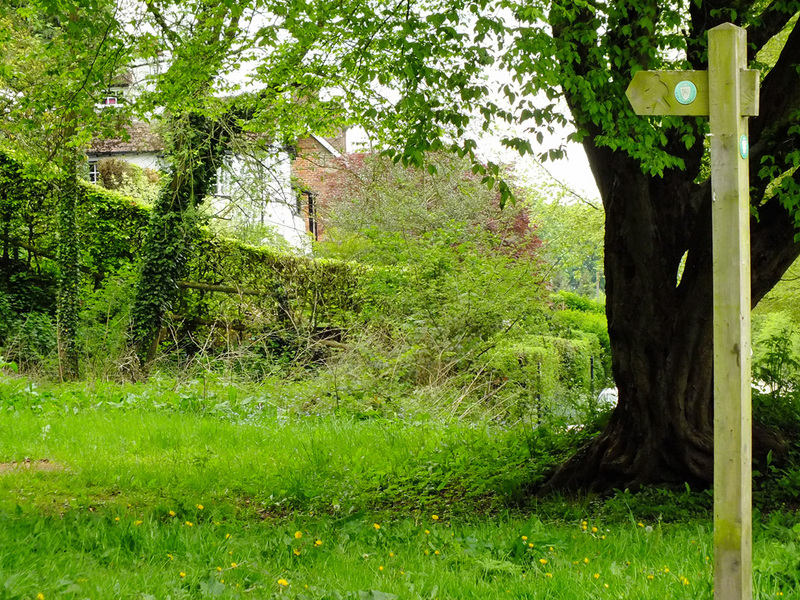 A very peaceful place to stop and rest and absorb the beauty of nature. 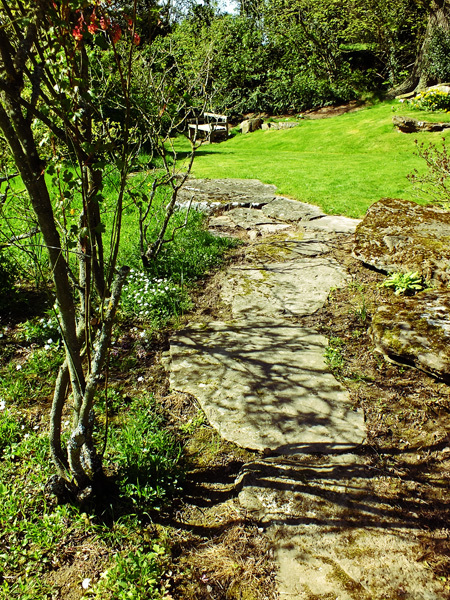 Lots of little paths to wander along. And a wider one which leads to the Grotto. 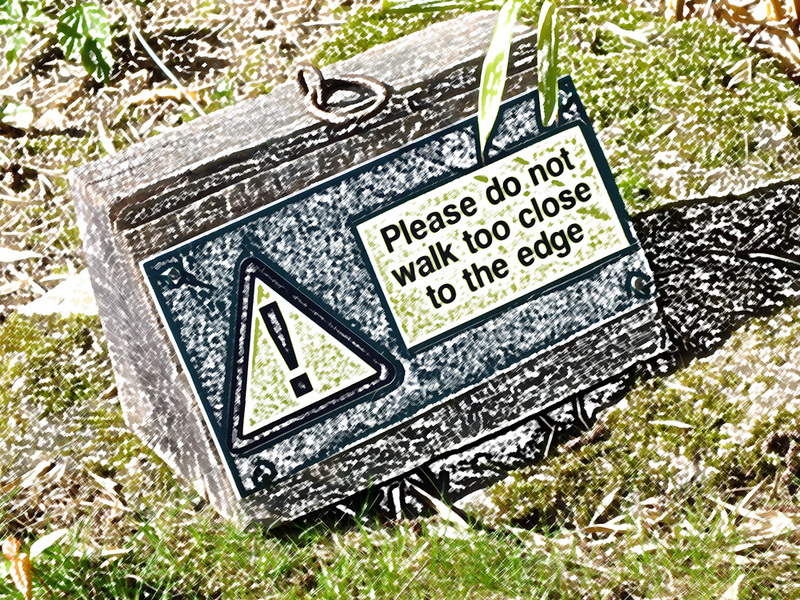 But watch your step! Finally on the way back to the exit there are the Iris Walk and the Greenhouses which I can never resist having a nosey in. 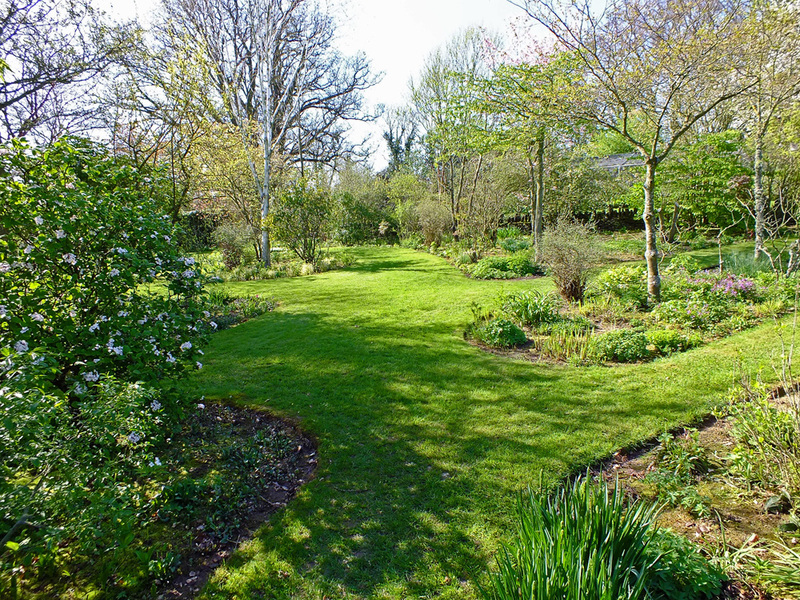 The irises weren’t in flower, so another visit is required, very soon. 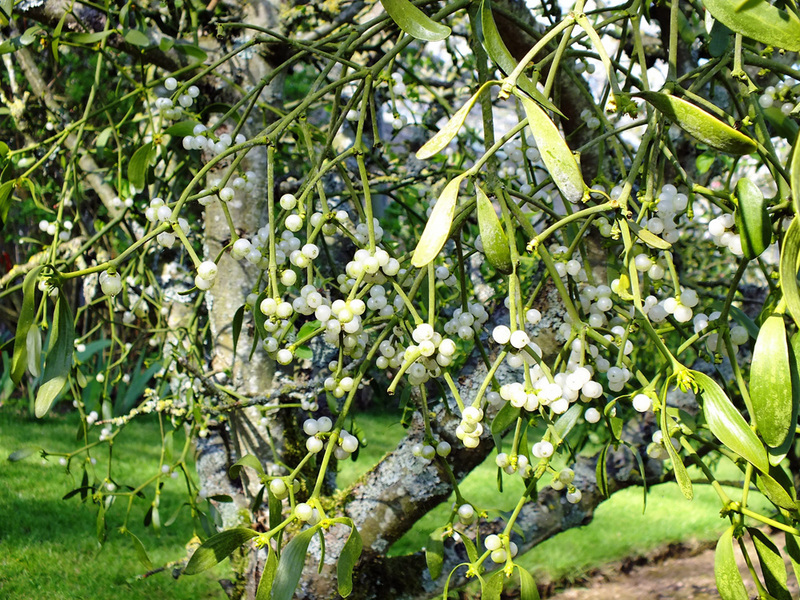 But I did find some mistletoe growing on a fruit tree. 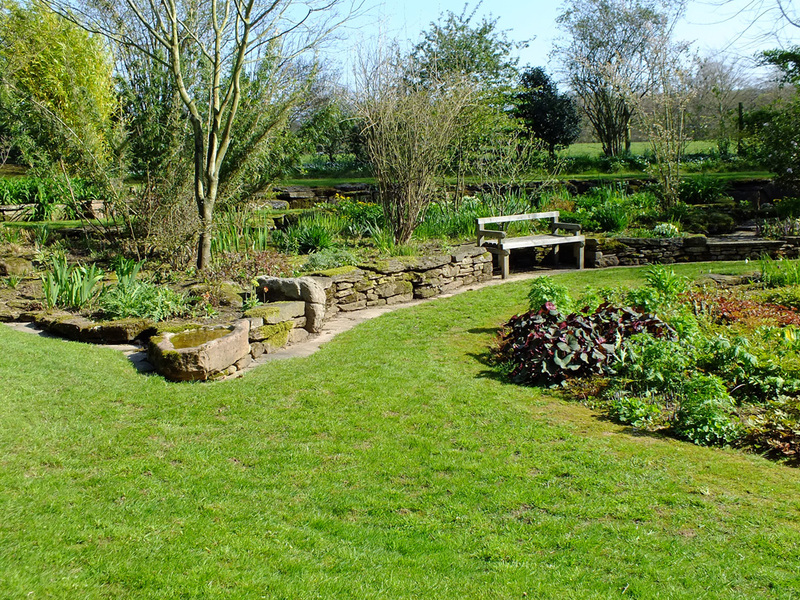 I hope you have enjoyed your visit to Stockton Bury Gardens in Herefordshire. It has a very long history as there has been a dwelling on this site since 660. The ‘Bury’ is a Saxon word for Court House or Mansion House and was given the status of a Manor in the reign of Edward III. 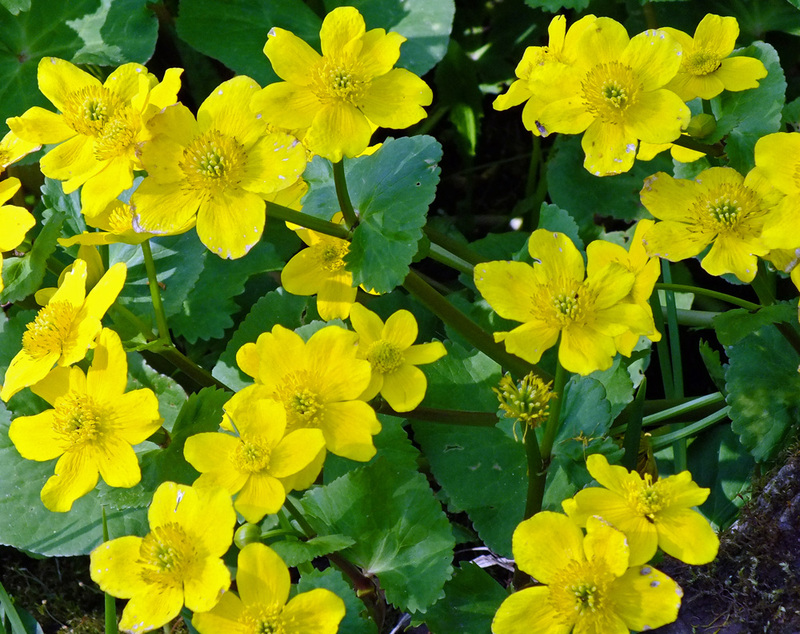 “May comes sweet and complete in every detail. On Sunday when the sun was shining I thought I’d grab the camera and go for a walk along the Bread Walk, which is a walk alongside the River Teme, here in Ludlow. After the pavements of London it made a nice change to have the earth beneath my feet again, well not literally of course, though I do like bare-foot walking on grass or sand. 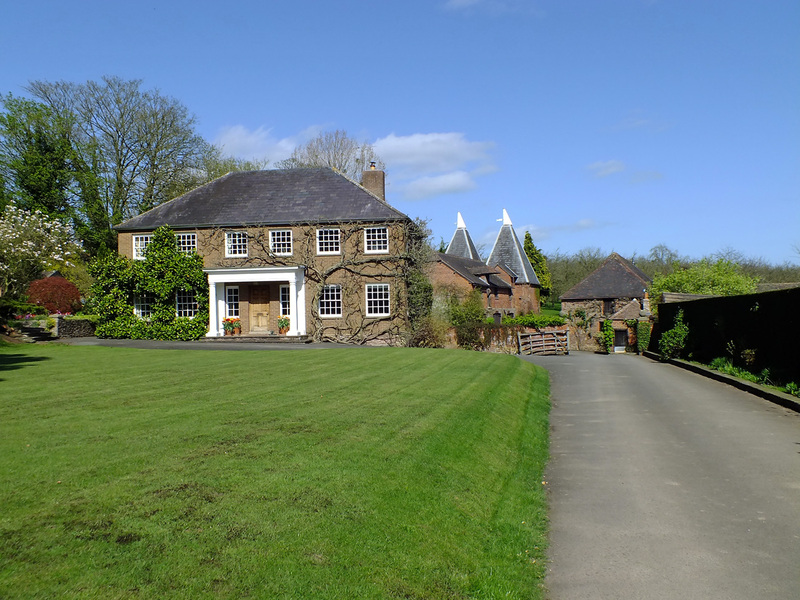 I have mentioned the Bread Walk before in my first ‘Guide to Ludlow‘ and basically it was an early form of the dole, where unemployed men were paid in bread and blankets to re-build the pathway, destroyed by flood, so they wouldn’t drink away all their wages in the inns on their way home. 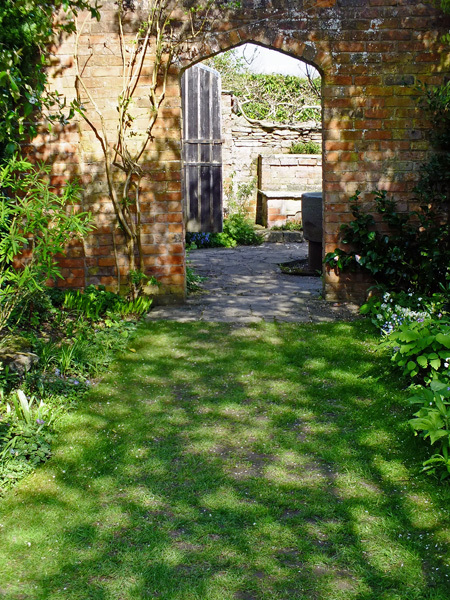 We’ll start by walking through the Broadgate, the only surviving gate in the town (there were seven) and have a nosy at the container flowers grown outside the cottages in Lower Broadgate – they are kind of rivals in the Ludlow in Bloom competition held each year. I have to say they are looking good. 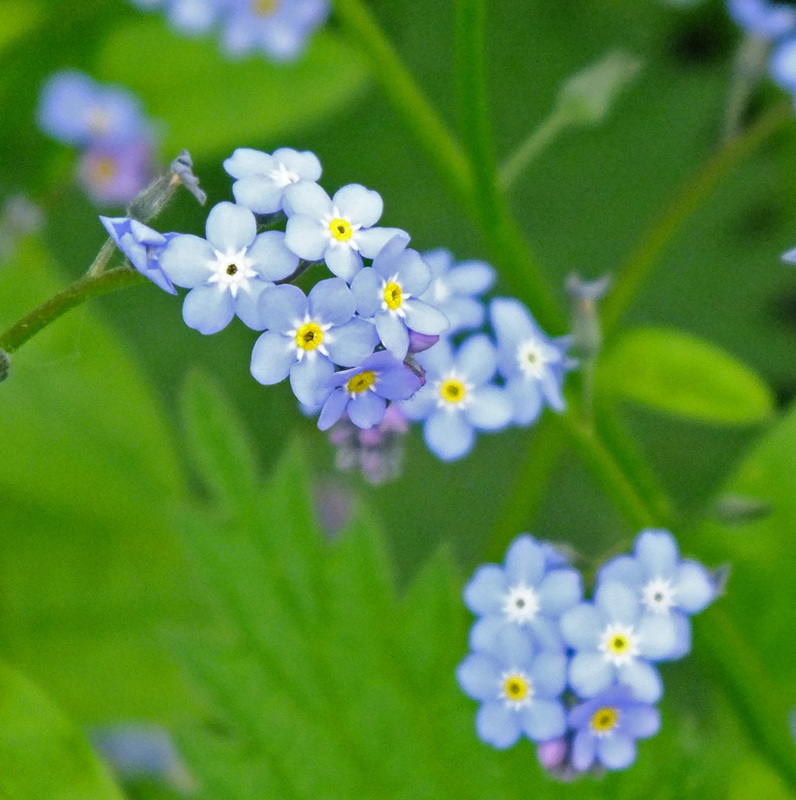 But judging isn’t until June so these beauties will be long gone by then. Now across the Ludford bridge, past the Charlton Arms, no stopping for a pint just yet, and round the corner, up the steps to Whitcliffe Common. 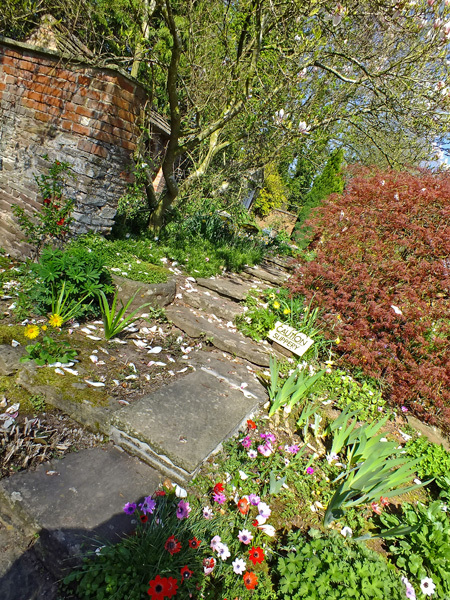 The steps are very dry, which is unusual because I thought there had been rain whilst I was away. Anyway, dry is good as they can be slippery when wet with all the mud and leaves. Onto flat ground and time for a breather as we admire, yet again, the view over the town. I don’t think I shall ever tire of this view. And today there is something different about it as the May Fair is in town and you can just about make out something on the horizon called the ‘Explosion’ which swings people around like a giant mixer. 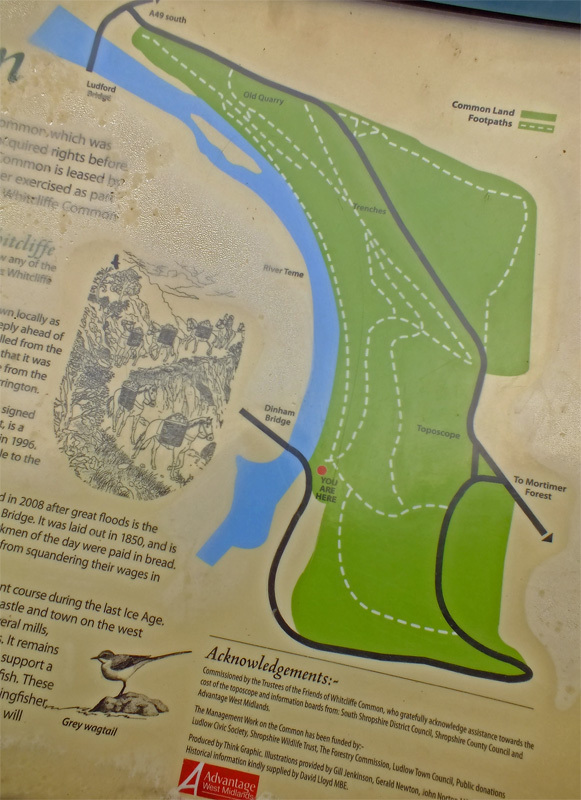 From here you can continue on the flat and across to Whitcliffe Common, and through the woodland, but we have done part of that walk before. 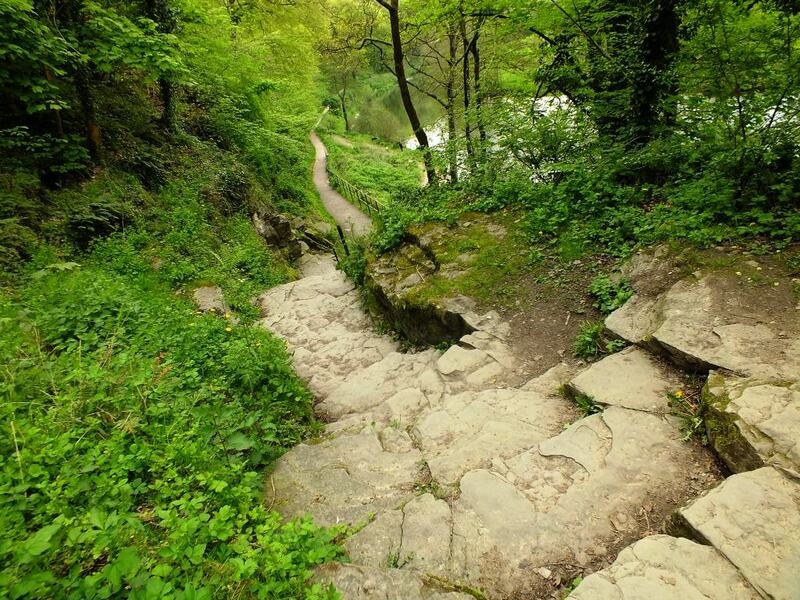 Today I’m going down more uneven steps onto the path beside the Teme. There’s always something different to see along this walk, wild flowers, birds, ducks, dogs swimming, sheep across the river in the paddock now with their lambs, reflections in the still water and the sound of birds trilling in the trees trying to make themselves heard above the rush of the mill weir. Today there is some debris caught at the top of the weir, and two Labradors enjoying a swim. Looking up to the top of the cliff everything is a vivid new green – ferns and trees unfurling their spring shoots. If you look ahead you can just glimpse the castle and Dinham bridge where the walk ends. It is a very short walk. Dandelions line the path here, but further on we’ll find some different wild flowers. 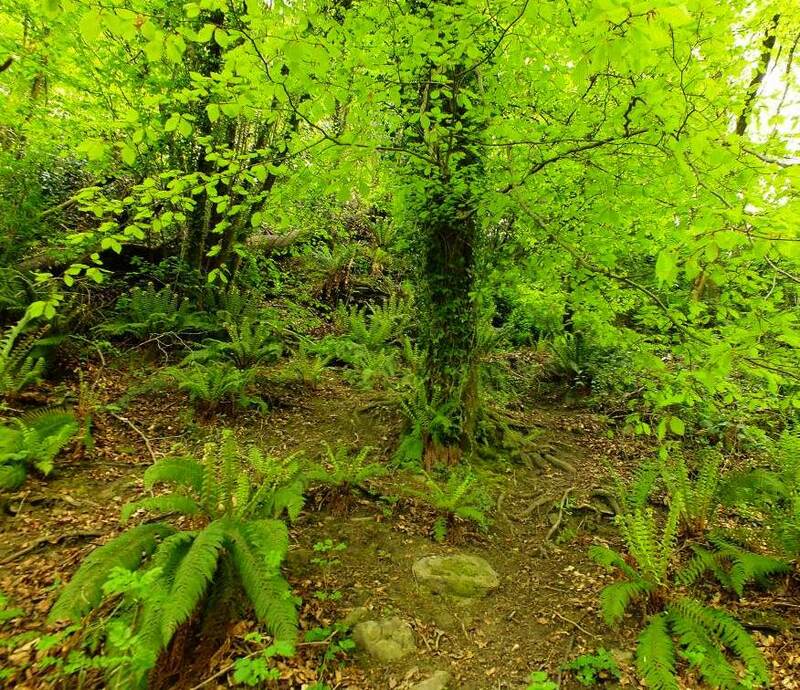 Above us is another path leading up to the common through the broadleaf woodland. 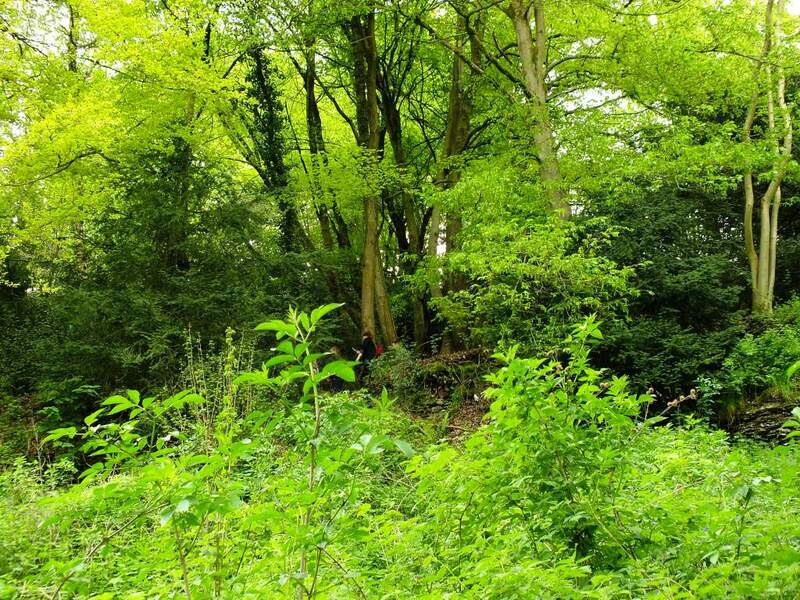 The foliage is so lush at the moment it is difficult to see anyone. But look carefully. 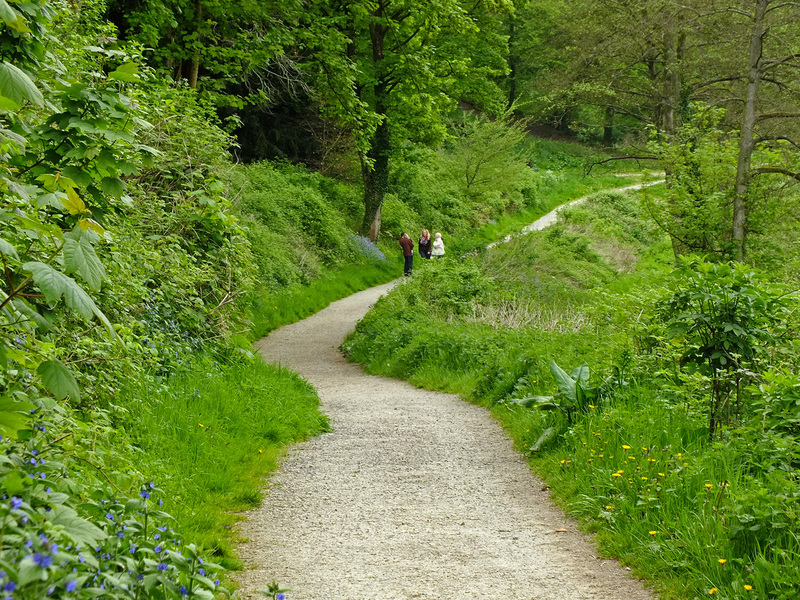 The path curves around past clumps of forget-me-nots and alkanet (both members of the Boraginacae tribe) and patches of wild garlic amongst nettles and dock leaves and blackberry brambles. 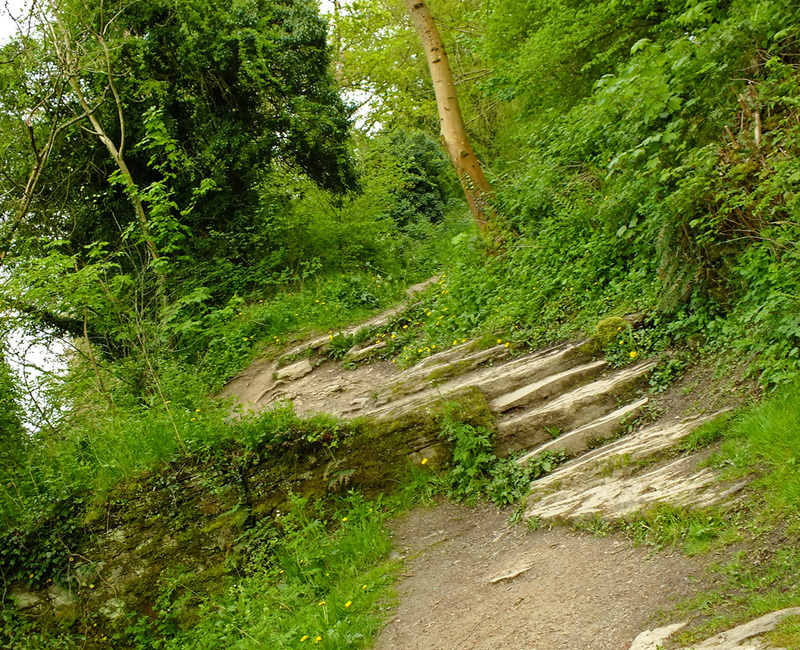 As we reach the end of the walk there are two pathways leading up to Whitcliffe common. 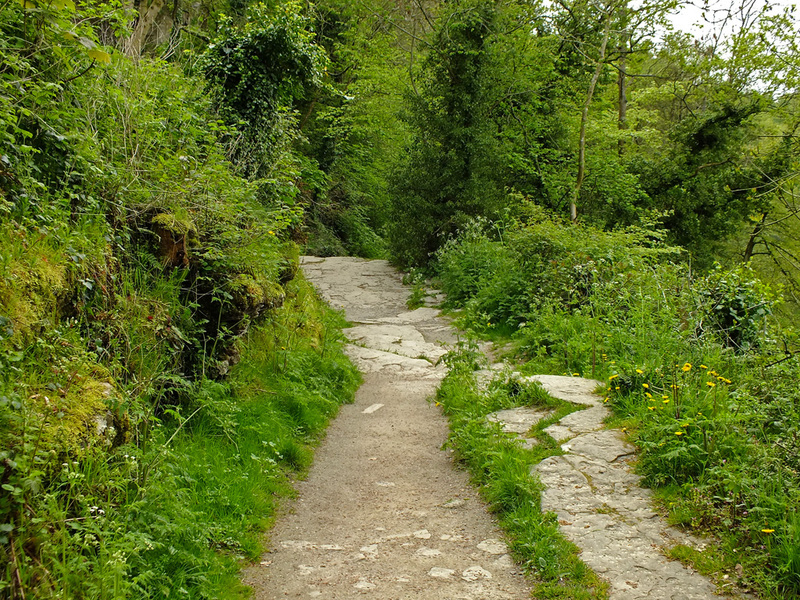 Packhorse Path known locally as the Donkey Steps, climbs steeply ahead of you through the woods. 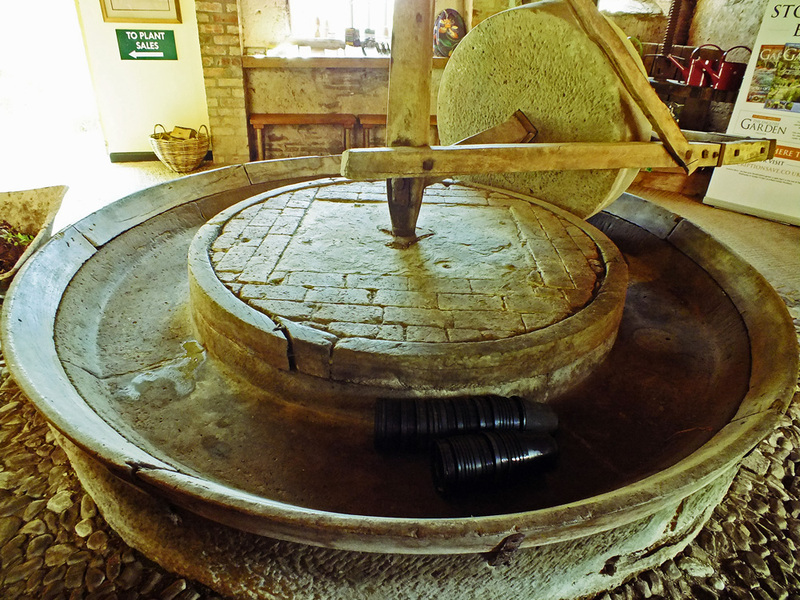 So called from the long-established folk tradition that it was used by packhorses to carry ore from the Clee Hills to the ironworks at Burrington. 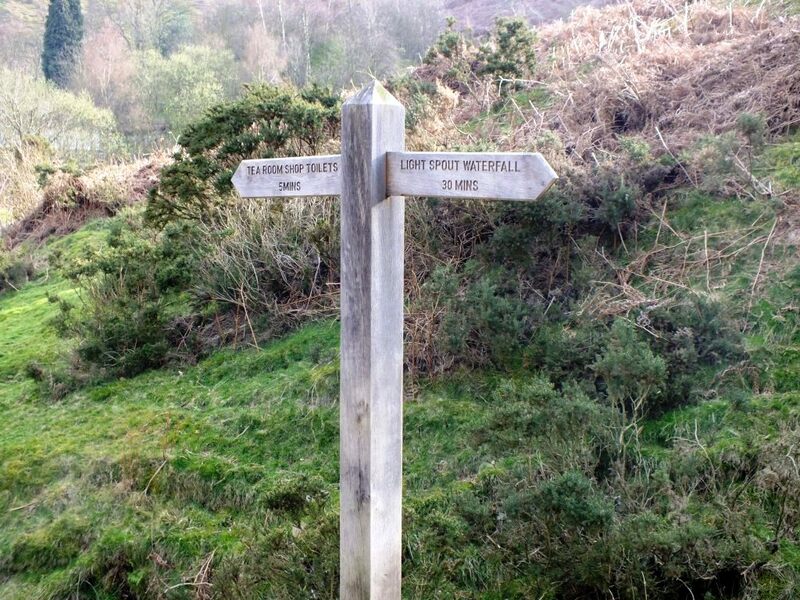 The Mortimer Trail which is signed through the woods to your right is a long-distance footpath established in 1996. 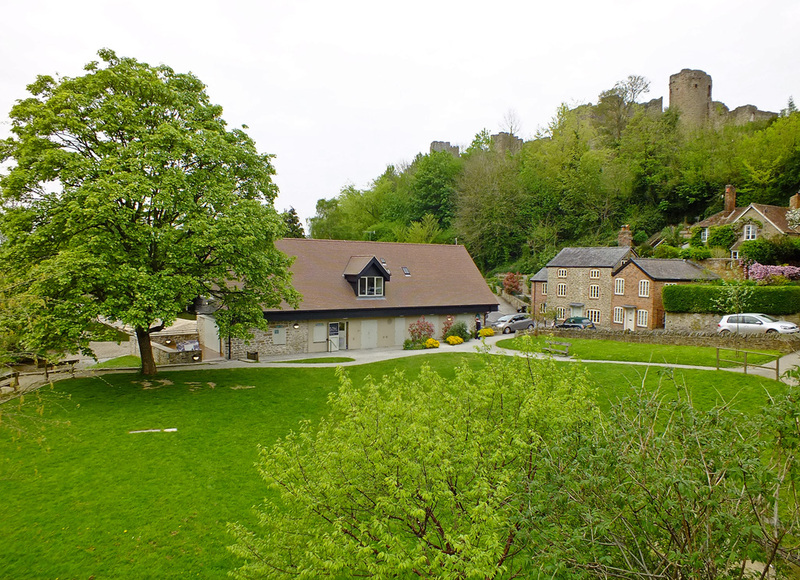 It runs for 30 miles from Ludlow castle to the centre of Kington in Herefordshire. 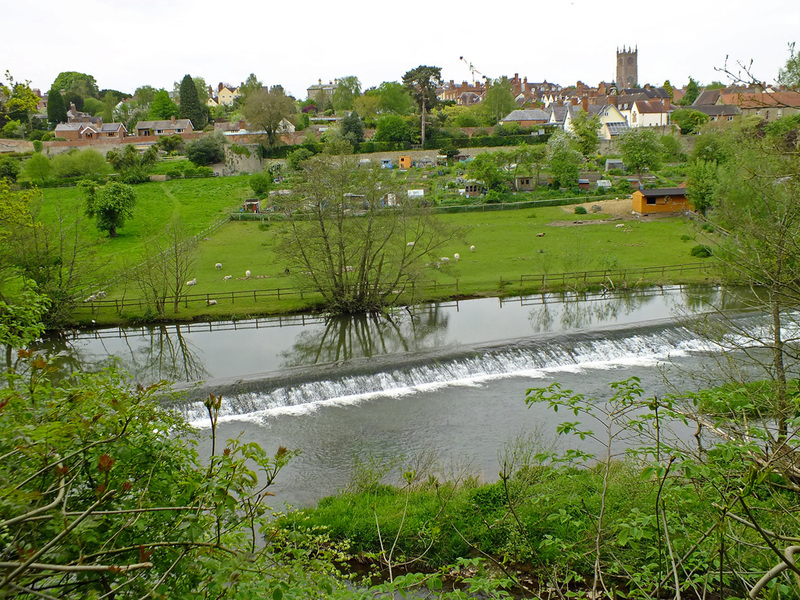 The River Teme powered several mills in the past controlled by a series of weirs. 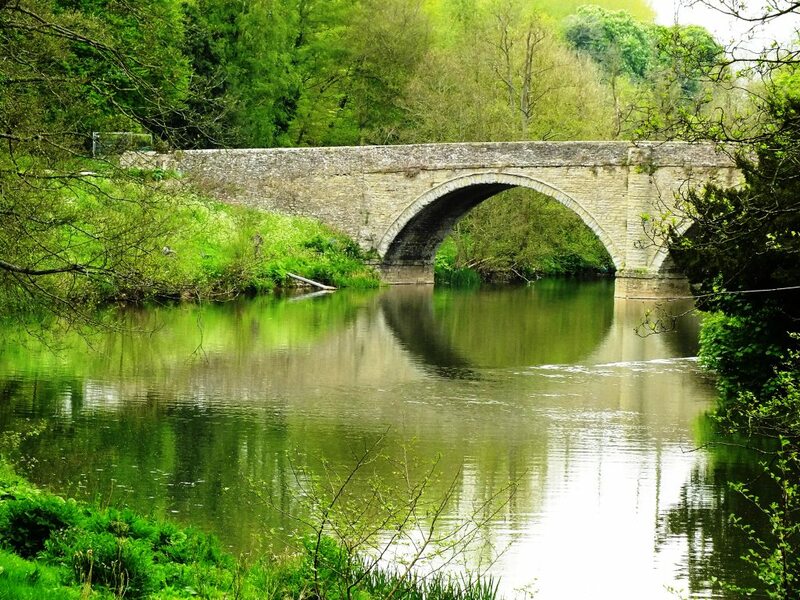 It remains a clean river, clear well-aerated waters support a healthy population of fish and aquatic insects. These are fed upon in turn by birds such as kingfisher, dipper, grey wagtail and heron which will sometimes be seen from the Bread Walk. We are now at the end (or beginning) of the Bread Walk and to return to the centre of town you need to cross the Dinham Bridge. 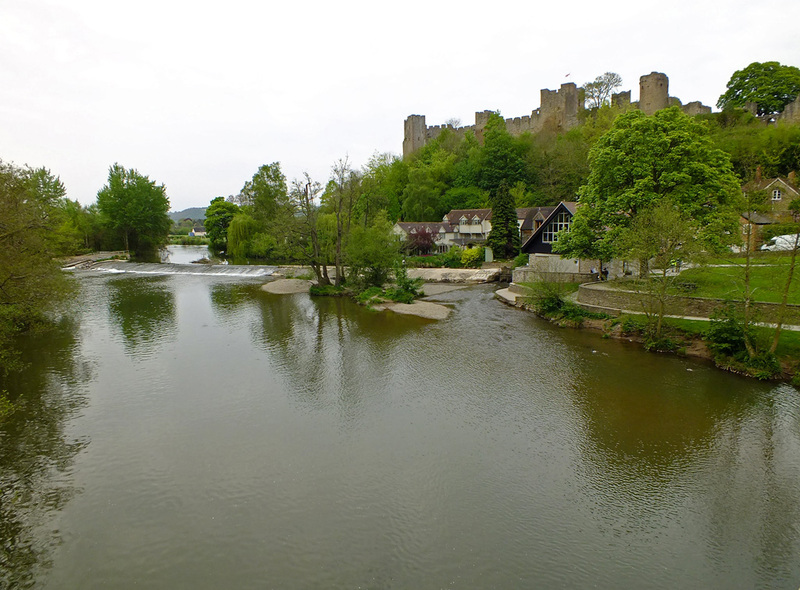 Where you will get the classic Ludlow view of the castle and the Dinham Weir, which is the only place where I have seen a heron. And if it is open, the Green Café on the Millennium Green serves a good lunch, but sadly not today. 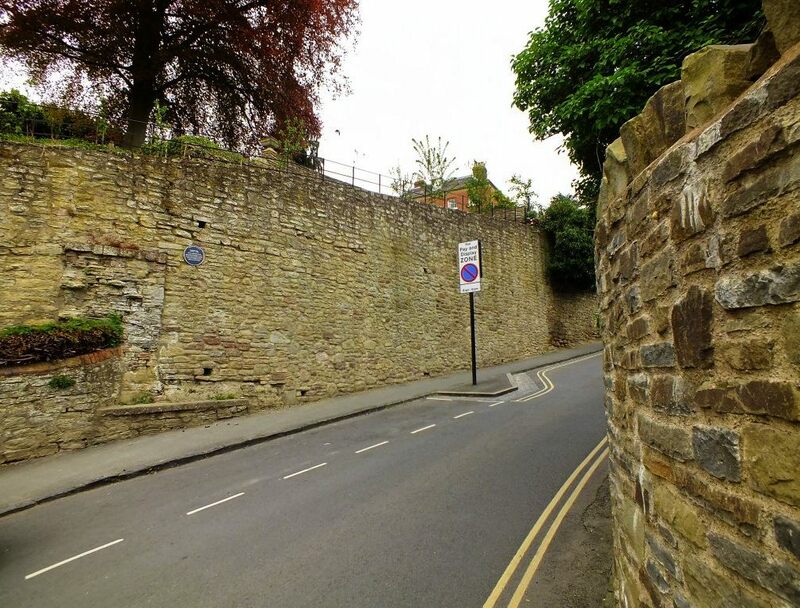 Now head up Dinham where the Dinham Gate (demolished in 1786), a medieval postern gate with a chamber over an arched entrance through the town wall, faced towards Wigmore and Wales. 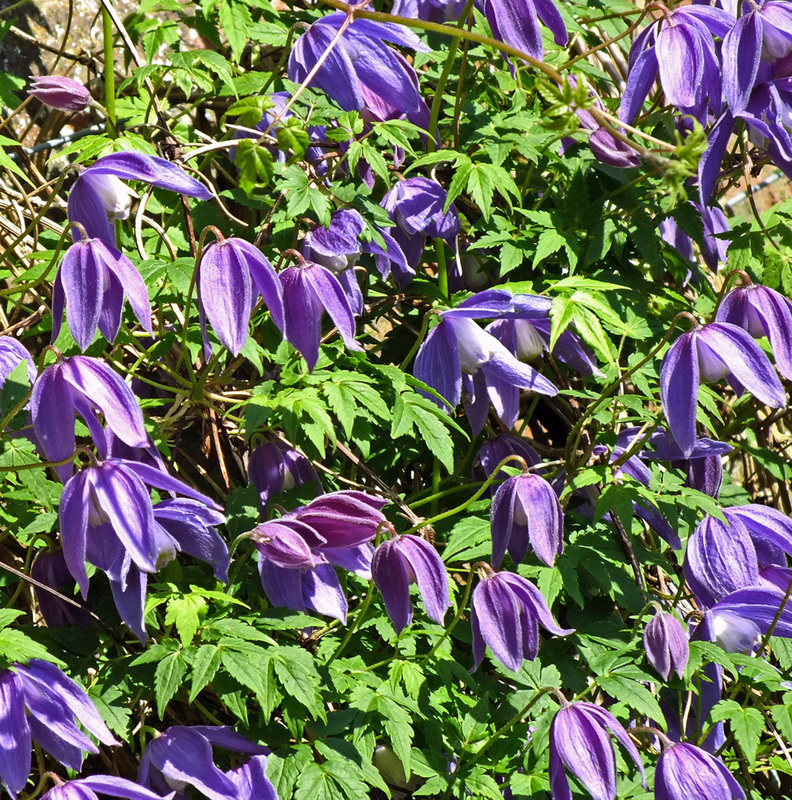 Look out for a hedgerow of lovely fragrant lilac and then follow the old town wall back to the castle square. 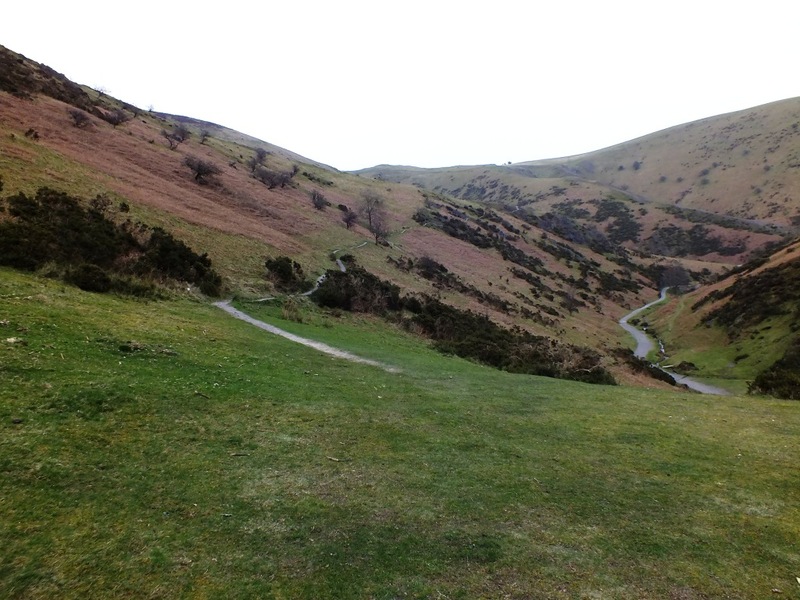 I’m combining Cee’s Which Way Challenge with Jo’s Monday Walk again this week as they complement each other. Join in with Cee’s challenge and view other ‘Which Ways’. 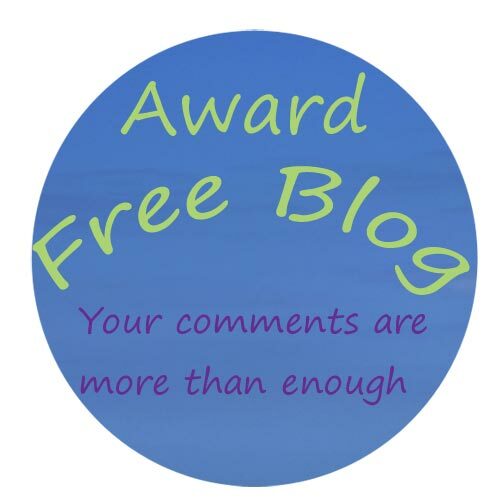 and take a look at Jo’s Monday Walks over on Restlessjo’s blog where you are in for a treat and I guess I should also link this post to Ailsa’s Travel Theme which this week was Rivers. 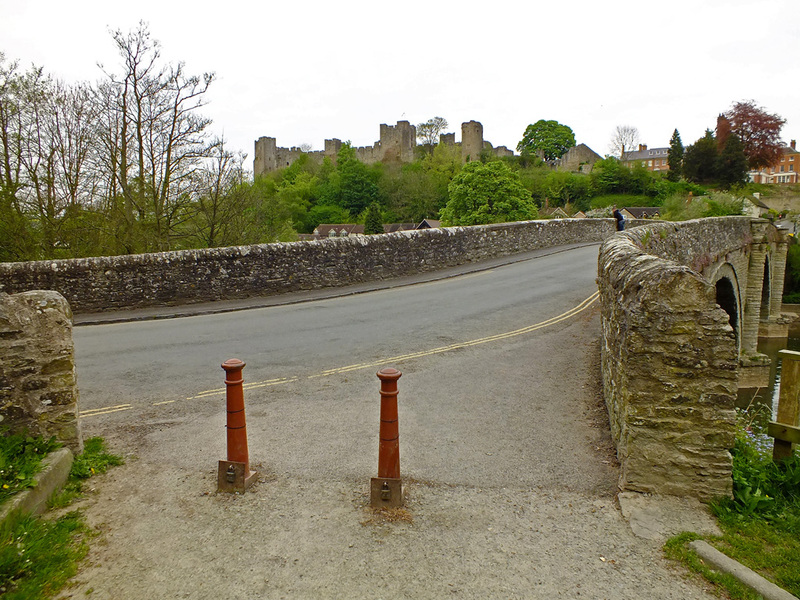 Last Monday the weather was so good that I popped out for a stroll around Ludlow Castle. This is a ruin, but quite an interesting one, and it dominates the skyline from the river side of the town. It has a combination of architecture from Norman, Medieval and Tudor times. Parts date from the 11th century when built by Walter de Lacy. It was enlarged by Roger Mortimer in the 14th century and has been in the hands of the Earls of Powis since 1811. The castle was a seat of government for Wales for a time and it was involved in the Wars of the Roses. 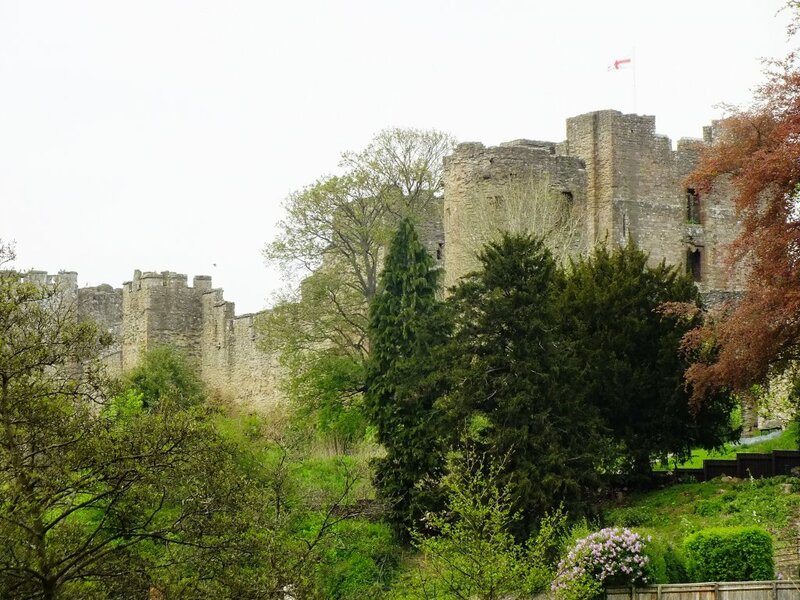 Often events are held in the castle such as the Christmas Medieval Fayre (late November) and the Ludlow Festival held in the summer which features an open-air production of Shakespeare. Starting in the castle gardens at the end of Castle Square (where the open market is held at least three times a week) , this walk takes you down Dinham, past a few Georgian houses and this timber-framed example which must have been a public house once as there is a Welsh Harp hanging outside. Then exit right through the outer castle wall. 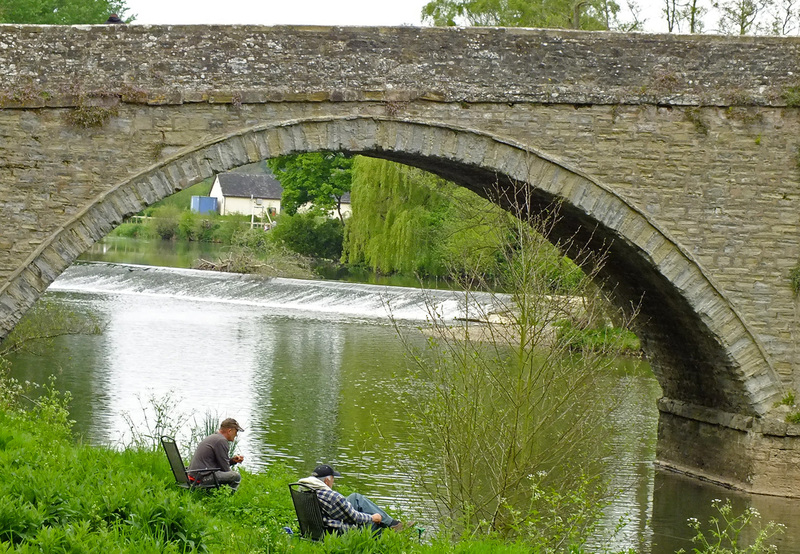 After leaving the path next to the outer wall you find yourself above the River Teme and Dinham Bridge. With the castle behind you, turn right along a dirt track which leads around the base of the castle. 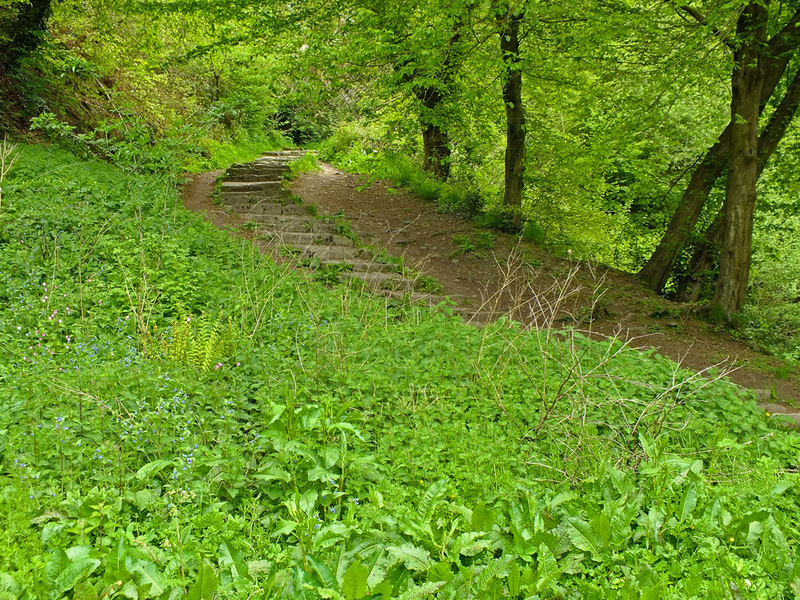 This leads to a lovely bench where you can rest and admire the beautiful views. 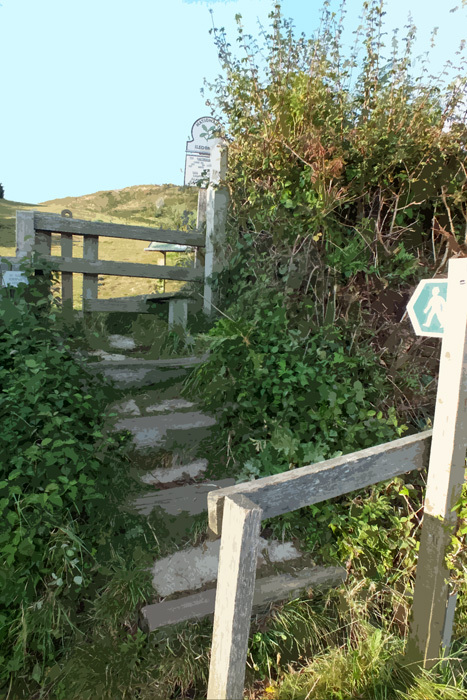 Unless you have the feet of a goat, and I don’t, you need to turn round here and head back to the archway, then make your way down hill and around the castle on a lower level path. 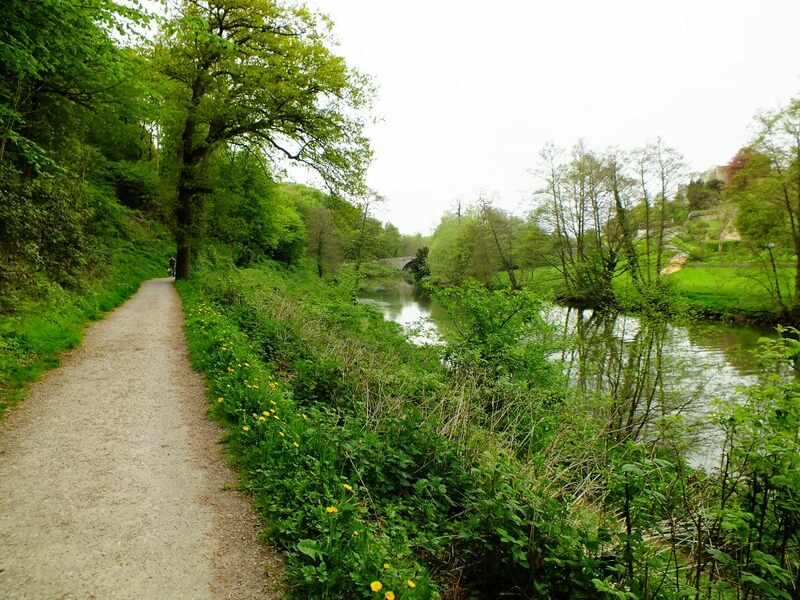 The path splits and you can head even further down to the river and the Dinham bridge and a lovely café where you can have lunch, or tea and cake or simply an ice-cream. But we are going to carry on up the hill and make our way around the castle back to the square. This is a very short walk, but it can take a while, if like me, you stop to look at the views, take photos and sit and enjoy the sun. At then end of the walk, near the square you’ll find another bench to rest your feet, before completing the loop. And a quick peek through the gates. 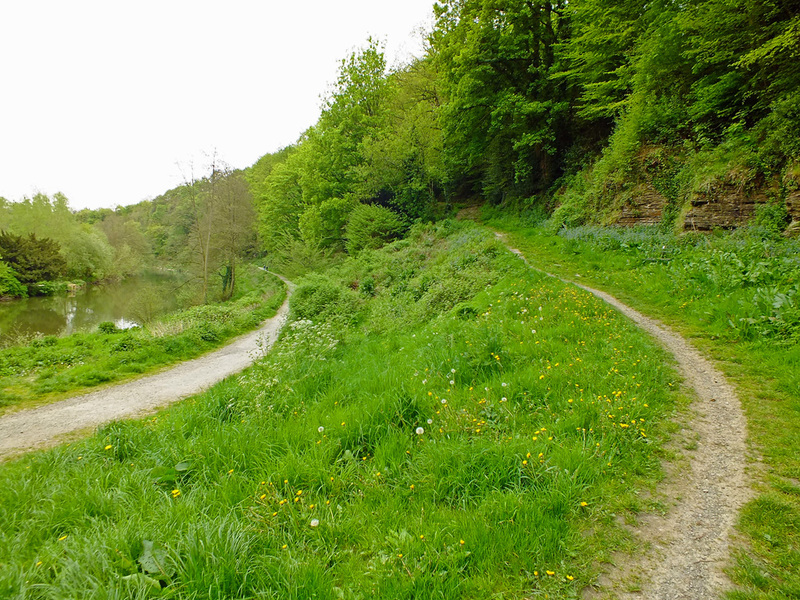 I’m combining Cee’s Which Way Challenge with Jo’s Monday Walk this week as they seem to complement each other. 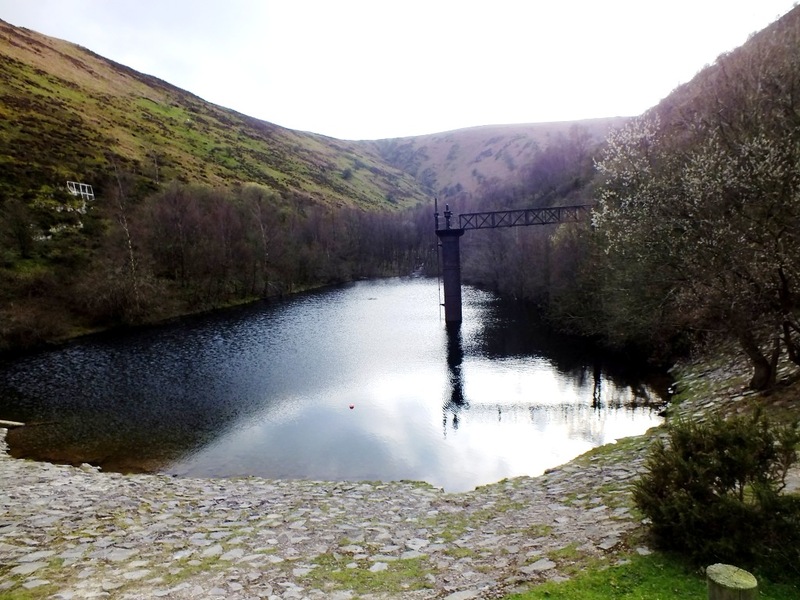 and take a look at Jo’s Monday Walks over on Restlessjo’s blog where you are in for a treat. 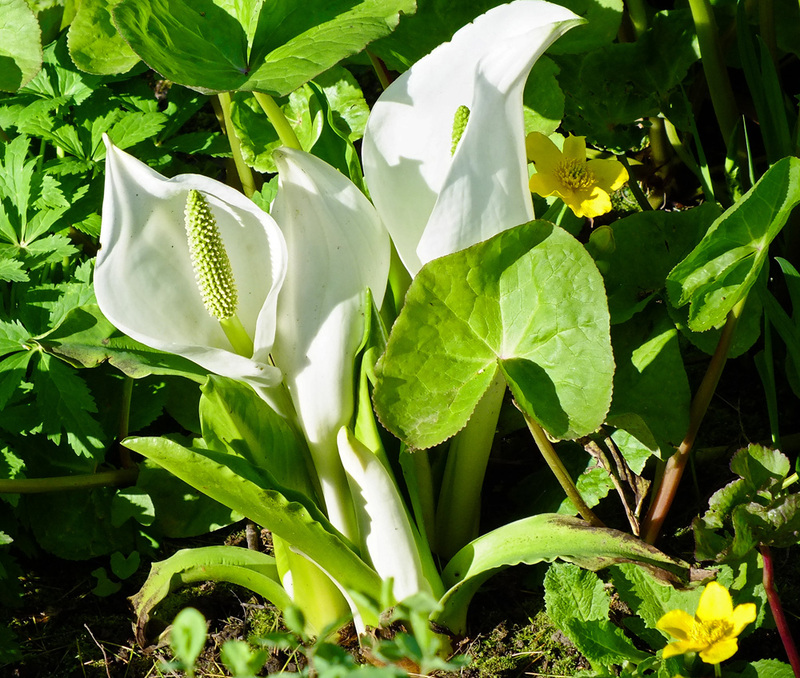 Fortunate to have a lovely sunny day on Sunday (Mother’s Day in the UK) and an extra hour of daylight (the start of British Summer time so clocks went forward an hour) I was determined to get out of the house and go for a walk. 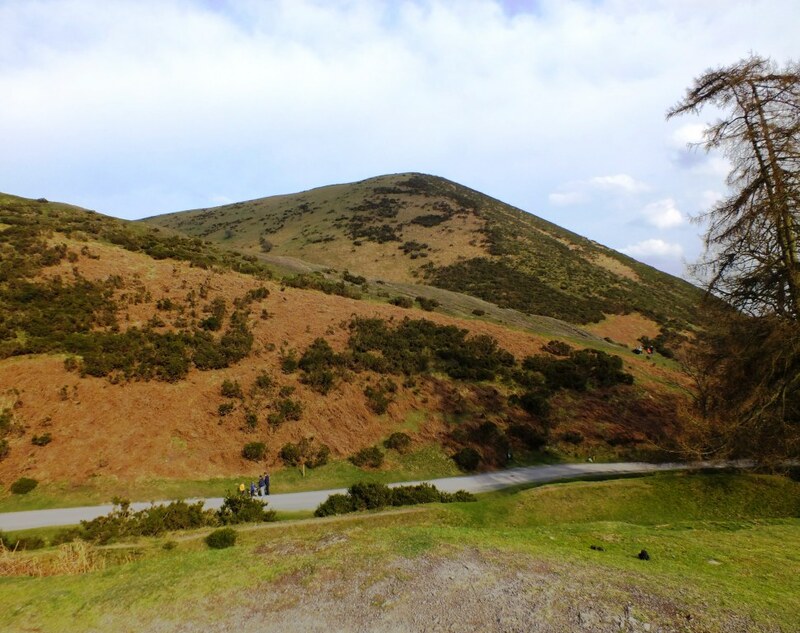 Just as Ludlow is the gastronomic capital of Shropshire, Church Stretton is the walking capital of the Shropshire Hills Area of Outstanding Natural Beauty. 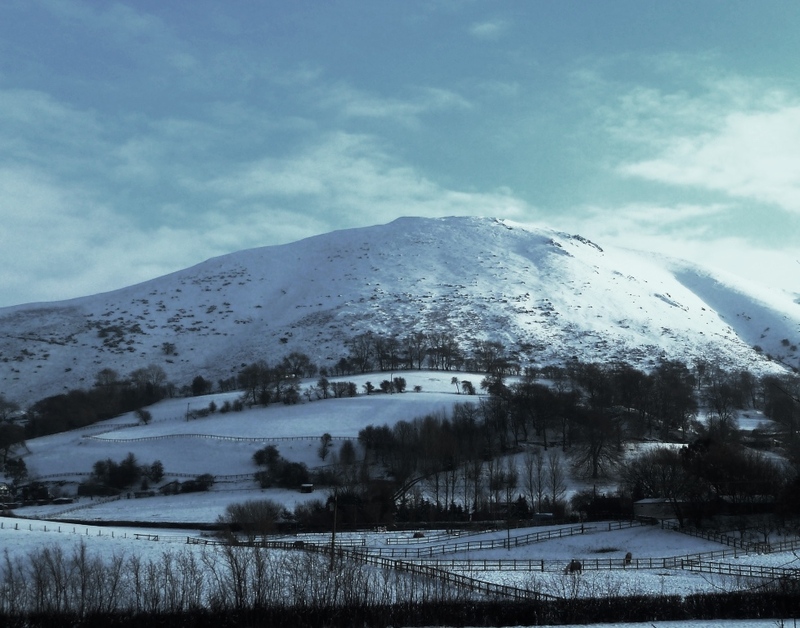 I have been here many times, it is my favourite part of Shropshire and has been called ‘Little Switzerland’ on account of its hills. And when coated in snow it is very pretty. But on Sunday it was sunny and spring was springing. We could have taken any number of trails, but decided that we’d return to the Reservoir as it is a wide path and fairly flat. 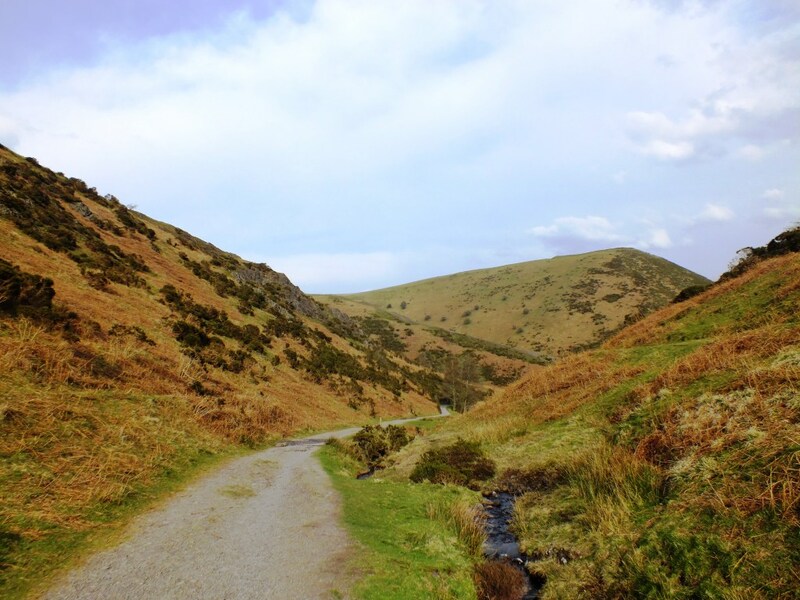 This trail is quite gentle and soon you are hidden amongst the hills with only the sound of birdsong and a burbling brook. A hidden lost world. 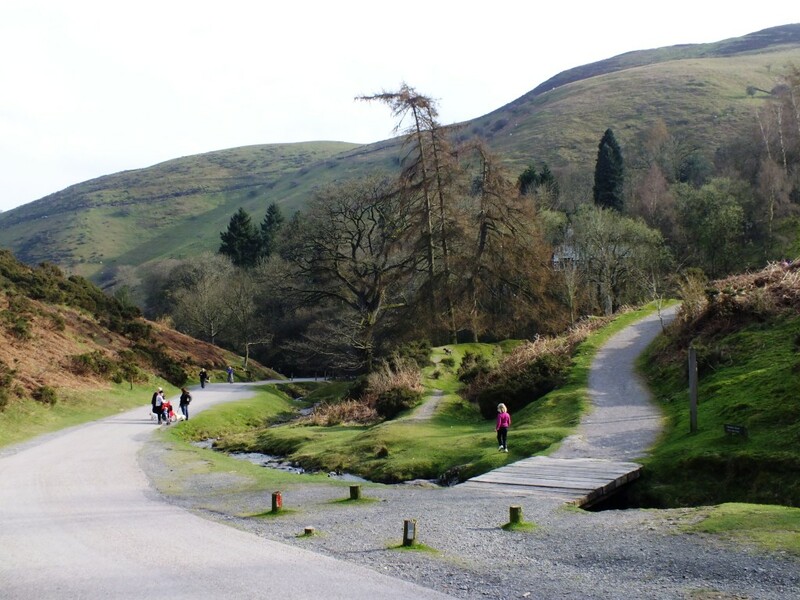 At the reservoir you do have to climb up quite a steep hill to reach the water, and the trail continues should you wish to head further onto the Long Mynd (Long Mountain). You can swim in the reservoir, though the water probably isn’t all that warm today. Before heading back to the car park I nipped over a stile to have a closer look at the reservoir and found this pair of Common Toads at the side of the path. I spared them their blushes and swiftly moved on. Doesn’t look as though we can go this way, so head back down the hill. 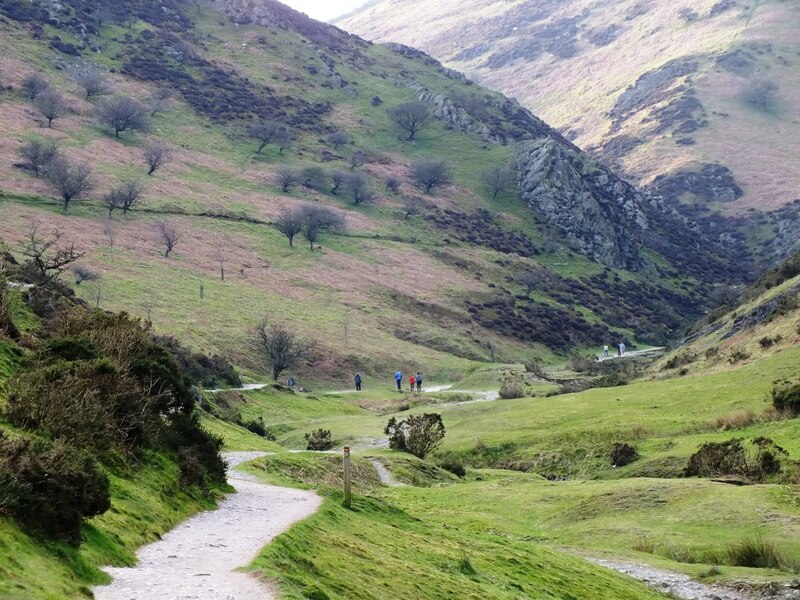 A choice of routes, but I’m going to stick to the one I came along, the other one looks as though it might end in a sheep trail and I’ve been there before and it didn’t end well. 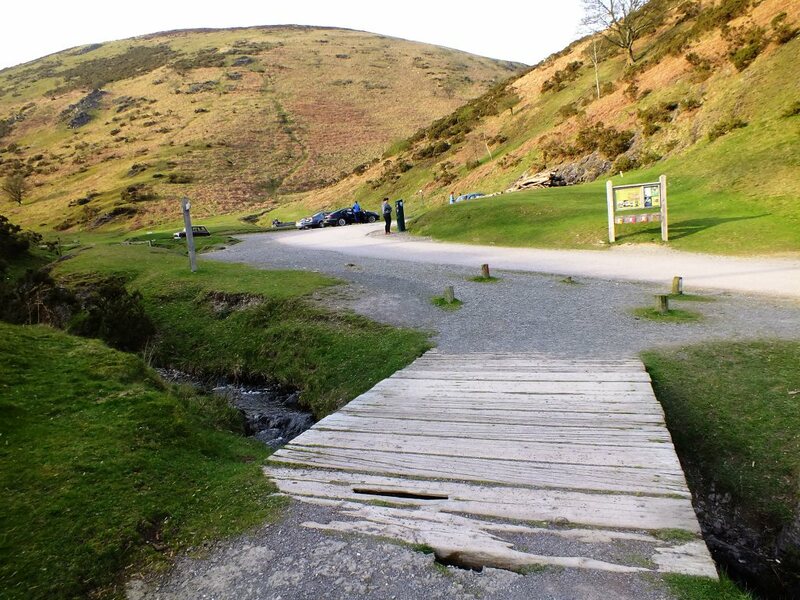 Or you could go over the stream and head for a path on the other side. Returning on the orange route there are caves up on the left, and ahead on the top of that hill in front are the remains of an Iron Age Hill Fort. Back at the road we could turn right and walk to the tea-room, but as it is now after 5 p.m. it will be closed. We’ll head back to the car, after one last look around and go home for a well-deserved glass of red wine. 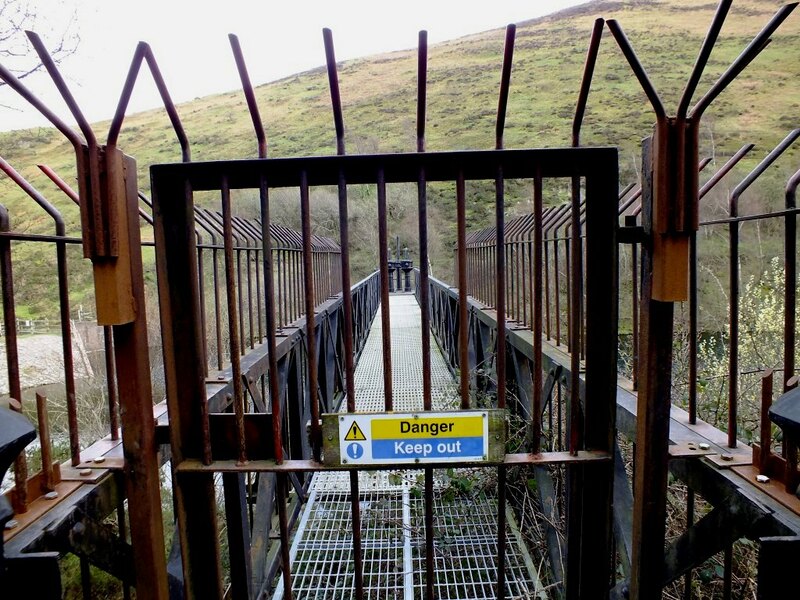 If you decide to come for a walk here, please take note of the signs. Some people seem to think their dogs are much better controlled than they actually are around sheep, and watching a sheep being chased is not amusing for me or the sheep. That means on a lead! Next time I’ll take you up the red route and see if we can find the waterfall. Join in with the challenge or view other ‘Which Ways’. 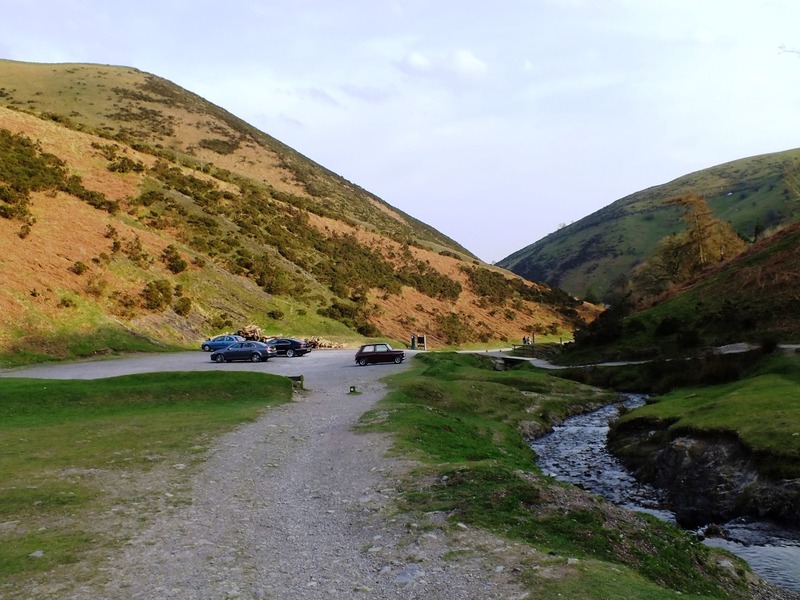 and you may like to have a look at Jo’s Monday Walks over on Restlessjo’s blog where you are in for a treat.